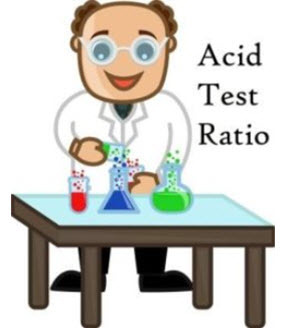 ‘Quick ration, or ‘acid-test ratio’, is something you may well have heard about and yet you may not be sure what it actually means. It’s a very useful financial term to know about, especially if you’re looking to investigate a company’s financial health – possibly for investment opportunities. In a nutshell, the quick ratio is calculated to show if a company has enough assets which are short-term to cover the liabilities of the company in the immediacy. It basically measures a company’s ability to meet these liabilities without needing to sell inventory – i.e. cash or quick assets which can be sold off quickly to meet liabilities if needed. How is Quick Ratio Calculated? The formula is simple and memorable: Cash + accounts receivable + short-term investments divided by current liabilities. ‘Short-term investments’ are assets that can be liquidated in a short period of time. ‘Current liabilities’ include debts in the short-term, liabilities that have been accrued and accounts payable (money owed to the suppliers of a company). Existing liabilities are not considered in quick ratio, unlike with other capital ratios. When considering the quick ratio of a company, it is most useful to compare the company with companies of the same industry because it is more likely that they will compete under similar conditions, and so you will get a more accurate result. At the very least, companies with good financial health should have a quick ratio of 1.0. In the vast majority of cases, you’ll find that the higher the quick ratio, the better the financial health of a company. There are, however, some cases where this may not be so -for instance, a company with a very high quick ratio may have lots of cash, but this may mean it is not being invested back into the company or handed out to shareholders and of course this doesn’t look good from an investor’s point of view. As with other capital ratios, it is a good idea to have a look at quick ratios of a company from the last few years to get a good picture of the company’s trends. If the quick ratio of a company is increasing year by year, it would indicate they are experiencing sustained growth and is financially stable. On the contrary, if a company’s quick ratio has fluctuated over recent years or has decreased, it may indicate a company’s financial health is in trouble or that the company is financially unstable. Companies with quick ratio below 1 don’t have enough assets to cover their immediate liabilities. Of course, there are other factors that will come into play when looking at the financial health of company – the state of the economy, for example. However, if the quick ratio is fluctuating or decreasing, you should definitely approach with caution and investigate further before making any investments.